Dietary Reference Intakes are now political??? Is nothing in nutrition safe from congressional intervention? The DRIs are standards for daily intake of nutrients. The ones for sodium and potassium were last updated in 2005. I don’t think anyone thinks that potassium intake is debatable, but sodium is hugely controversial. Doctors generally advise reductions in sodium intake as a means to prevent high blood pressure. Some think sodium reduction unnecessary or potentially harmful. I cannot imagine that anyone appointed to this committee lacks an opinion. The point of the deliberations is, or ought to be, to review the research and try to come to some consensus about what the issues are and what to do about them. Its best if Congress stays out of this. I wonder which lobbying group or groups got to these members. Union of Concerned Scientists food systems analysts Karen Stillerman and Lindsay Haynes-Maslow have issued firm rebuttals to the School Nutrition Association’s excuses for opposing nutrition standards for school meals. Dana Woldow explains what’s really happening with schools that drop out of the meal programs ostensibly on the grounds that the new standards cost too much. Tucked within an Orwellian press release touting its efforts to “combat child obesity,” the Texas Department of Agriculture has made official its lifting of a decade-old ban on deep fat fryers in Texas schools, as well as rolling back other common sense school nutrition measures…despite the fact that our state ranks fifth in the nation for obesity among high school students, and despite public comments reportedly opposing the TDA’s plan by an astounding margin of 105 to 8. USDA Secretary Tom Vilsack pleads with the School Nutrition Association to stop fighting the healthier school meal standards. If you are baffled as to why the School Nutrition Association would oppose healthier meals for the children they serve, consider the food company sponsors of that organization and how aggressively SNA courts food company sponsors. (But there’s a ray of hope. Maybe, Dana Woldow suggests, the new SNA President will put kids’ health first). If you are baffled as to why healthier meals for school kids would induce Congress to try to undermine them, consider the companies that profit most from selling products that do not meet nutrition standards to America’s schools. waivers are not dependent on the availability of reasonably priced whole grain options. Let’s hope Congress removes these micromanaging provisions before sending the bill to the President. *Addition: Ten reasons why Congress should stay out of school lunch. Thanks to Tracy Fox for sending the latest salvos in the absurd political fight over nutrition standards for school meals. The first comes from the School Nutrition Association (scroll down to find the image). This is the organization increasingly discredited for its close ties to food companies that supply products for school meals, as well as its lobbying of Congress on behalf of those companies . The second comes from the Robert Wood Johnson Foundation, a major funder of anti-obesity initiatives. This particular political fight isn’t over yet. The School Nutrition Association is on the wrong side of this issue, as shown by the divisions in its ranks—the 19 former presidents who wrote Congress to oppose weakening the standards, for example. Who loses in this one? Kids’ health, alas. Understanding why school nutritionists want to scrap the USDA’s nutrition standards takes some effort. The question: Why is the School Nutrition Association (SNA)—the organization that represents the interests of “lunch ladies”—supporting Republican attempts to derail the nutrition standards? The SNA has a long and honorable history of fighting for better nutrition for children, and it supported the 2010 Healthy Hunger-Free Kids Act—the one that gave USDA the authority to mandate healthier meals. When the school-lunch program started, most schools cooked their own food. As the number of children participating in the school-lunch program grew, the need to provide more food led the schools to buy prepackaged, processed food, which led to the companies making those foods becoming big players within SNA. The story behind the school lunch flip-flop is a complicated web of lobbying change-ups, industry influence and partisan posturing inside the Beltway…Interviews with more than a dozen former and current SNA officials reveal a dramatic shift in SNA’s policy platform, and even more so, its approach: choosing to wage war on Capitol Hill — pitting the association against [Michelle] Obama and her team — instead of trying to win more concessions directly from the Department of Agriculture…[This] has sparked a civil war within the nutrition community and the association itself. Nineteen former SNA presidents wrote to appropriators last week urging them to reject calls for a waiver — a break in ranks that was painful but necessary, signers said. Several former presidents of the organization said they are worried that food companies have influenced the group’s agenda over concerns that the nutrition standards for the $11 billion program will take a big bite out of sales of popular items like pizza and salty snacks…About half of the group’s $10 million operating budget comes from food industry members. Is SNA isolated? Indeed it is. Here’s the list of organizations that support the new standards, compiled by the American Public Health Association. Today, the House Appropriations Committee will discuss the annual spending bill for the Agriculture Department, meaning that it will consider proposals to weaken nutrition standards for school meals. In what has to be a groundbreaking move, First Lady Michelle Obama has an Op-Ed in today’s New York Times. Yet some members of the House of Representatives are now threatening to roll back these new standards and lower the quality of food our kids get in school. They want to make it optional, not mandatory, for schools to serve fruits and vegetables to our kids. They also want to allow more sodium and fewer whole grains than recommended into school lunches. …Remember a few years ago when Congress declared that the sauce on a slice of pizza should count as a vegetable in school lunches? You don’t have to be a nutritionist to know that this doesn’t make much sense. Yet we’re seeing the same thing happening again with these new efforts to lower nutrition standards in our schools. Yes, they do, and how terrific that she is saying this. It is “inappropriate to let politics and pressure from the food industry” change federal law. “The President and First Lady both feel very strongly about the need to continue moving forward when it comes to school nutrition and not allowing politics to pull us backward,” Carney said. Carney made his comments during a gaggle aboard Air Force One when asked about the President’s “reaction” to the First Lady’s event on Tuesday with school nutrition pros. For a nutritionist like me, this is history in the making. Cheers to both and let’s hope their efforts work. Addition, June 2: If you cannot understand why the School Nutrition Association is pushing for the waiver and elimination of the rules, see Jerry Hagstrom’s lucid explanation: they don’t cook. When the school-lunch program started, most schools cooked their own food. As the number of children participating in the school-lunch program grew, the need to provide more food led the schools to buy prepackaged, processed food, which led to the companies making those foods becoming big players within SNA. Under the new rules, those companies have to come up with tasty products with less salt, sugar, and fat and use whole grains. At the same time, the fruit and vegetable requirements—which bring more business to the United Fresh Produce Association—threaten to take up more of the school-lunch budget. At a time when Michelle Obama is under widespread criticism for complicity with the food industry (see Fed Up!, the movie), she and her Let’s Move! staff are doing everything possible—openly and overtly—to preserve the nutrition standards in the school meals program. As I’ve written previously, a House subcommittee voted to allow schools to waive the new standards. Waivers mean that Congress is interfering—on political grounds—with nutrition standards established by scientific committees of the Institute of Medicine. Getting the USDA to speak out: Today, USDA Secretary Tom Vilsack is hosting a media call at 1:00 p.m. to discuss protection of the nutrition standards. Breaking the ranks of the School Nutrition Association (SNA), a school food service group heavily funded by food companies. SNA is on record as favoring the waivers. But, as Politico reports, 19 past presidents of SNA have just written Congress to oppose the waivers. It’s impressive that the White House is taking on this issue so forcefully. Support the Let’s Move! staff. 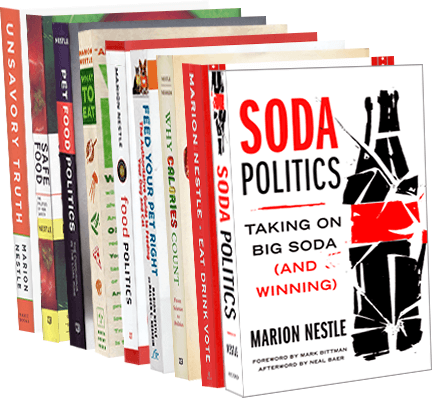 Sign CSPI’s Change.Org petition and write your legislators. They are discussing this issue right now. Tell them now! Reverse USDA’s nutrition standards for school meals. Reverse the exclusion of white potatoes from the WIC package. In the case of WIC and white potatoes, the provision follows on strong lobbying by the industry which is hoping to win similar language Thursday when the full Senate Appropriations Committee is slated to consider its own version of the same agriculture bill. …For the industry, concerned that younger women have moved away from potatoes, gaining access to WIC is an important marketing tool. Just as strongly, critics worry that the end result will be to open the door to other special interests and wreck a long-standing commitment by Congress to let independent scientists decide what foods are most needed. As I see it, the food industry couldn’t get its way through the usual rulemaking processes, so it did an end run and got Congress to overturn the work of no less than three committees of the Institute of Medicine. The House bill would undermine the effort to provide kids with more nutritious food and would be a major step backwards for the health of American children, just at the time childhood obesity rates are finally starting to level off. School nutrition standards are developed by independent experts, over 90% of schools report that they are successfully implementing them, and studies show they are working to help kids be healthier. USDA has continued to show flexibility in implementing these new standards, and Congress should focus on partnering with USDA, states, schools, and parents to help our kids have access to more healthy food, not less. United Fresh asks Congress to make no changes to the fruit and vegetable provisions. Write your Congressional representatives and ask them to leave nutrition standards to scientists, not food companies with vested interests in selling their products to government food assistance programs.